LOS ANGELES, CALIFORNIA – July 28, 2011 – Fuscoe Engineering, Inc. is happy to announce the expansion and relocation of its downtown Los Angeles office, which serves all of the Los Angeles region. To better accommodate its rapidly growing portfolio of Los Angeles area projects, Fuscoe Engineering has moved to a new office location in the heart of the downtown Wilshire district, just a few blocks from its previous location. Fuscoe Engineering has been active in Los Angeles County since the early 1990’s, having engineered dozens of projects in the region. Fuscoe's local assignments include public projects such as the award-winning Caltrans District 7 Headquarters; Baldwin Hills Scenic Overlook; East Los Angeles Transit-Oriented Development Specific Plan; Burbank Water & Power Master Plan of Drainage; Cesar Chavez Avenue and Lake Street Green Street Projects; Baldwin Park Downtown Specific Plan; Hollywood Aquatic Recreation Center; Los Angeles City, Southwest and Pierce Colleges; Los Angeles Unified School District projects; Alondra Park Water Play & Skatepark, and many others. Fuscoe Engineering’s project work for private clients in Los Angeles County includes the prestigious W Hotel and Residences at Hollywood & Vine; 1540 North Vine, 7950 West Sunset, The Village at Santa Monica, Gateway on 4th, Hikari, Wilshire & La Brea, 5550 Wilshire at Miracle Mile and 9200 Wilshire Mixed-Use projects; The Century Building; Sakura Crossing; Little Tokyo Block 8 Master Plan; Costco Wholesale projects; various Playa Vista neighborhoods; Element Power Renewable Energy Generation; and Ponte Vista Community, among others. Fuscoe’s specialized technical expertise and exceptionally responsive customer service are just some of the firm’s many assets that benefit both public clients and developers. “The new Fuscoe Engineering Los Angeles office will continue to bring vitally needed value added civil engineering services to the Los Angeles area,” stated Andrew Willrodt, P.E., LEED AP, Senior Project Manager. “With its well positioned downtown location, Fuscoe Engineering can fully assist both existing and new area clients with access to all that Fuscoe offers, including civil engineering, survey/mapping, eco-adaptive® design, storm water compliance and GIS/3D graphics services.” Andy is spearheading the operations of the new location with assistance from Project Manager Greg Mino, PE, LEED AP. Founded in 1992, Fuscoe Engineering, Inc. is a reputable, award-winning company providing civil engineering for land development and public infrastructure, using an eco-adaptive® approach. Specialty practices include survey and mapping services; water quality assurance; sustainable engineering; and GIS and 3-D visualization services. On-going firm objectives include developing cutting-edge and ground-breaking engineering solutions, while promoting sensitivity to the environment, offering clients a full range of environmentally sound and energy efficient green design options in full compliance with USGBC guidelines. 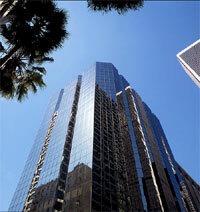 In addition to the Los Angeles location, Fuscoe has offices in Irvine, San Diego, Ontario, Palm Springs and El Centro. Several of Fuscoe’s Los Angeles projects recently earned five Pacific Coast Builders Conference (PCBC) Gold Nugget Grand Awards (its 1600 Vine at Hollywood & Vine, Wilshire & La Brea and Paragon at Old Town projects) as well as six Merit Awards. In addition, Fuscoe’s Baldwin Hills Scenic Overlook Project won the Los Angeles Business Council’s Annual Architectural Award for Best Civic Project. Fuscoe Engineering takes pride in embracing full circle thinking® in shaping places people enjoy through creative designs with heroic service. full circle thinking® is an underlying approach and fundamental series of truths that guide how the firm operates, who is hired and the way each project is approached.